Participants under 10 years old can participate in the Elk Calf Half Mile Run. The course for the half mile will stay on the school house property and will not enter the main road at any point. Participants of the 5k can chose to walk or run the course. The course starts and ends at the Benezette School House. After starting, participants will run around the town of Benezette and over the new bridge. 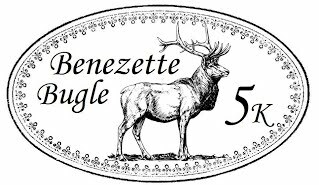 The course is relatively flat and gives participants a great tour of the town of Benezette with the possibility of passing some local elk! All children running the half mile run will receive a finisher medal for finishing and a t-shirt with early registration. After the race, stick around for a great time! For the 5k, prizes will be given to the top three finishers overall, male and female, as well as the top finishers in each age group. Music and food will be available.